Simha R. Magal, Ph.D. is Professor of Management (MIS) and Director, ERP initiative, in the Seidman College of Business, Grand Valley State University, Michigan. He received his Ph.D. from the University of Georgia. His primary research interests include e-business and enterprise systems. His articles have appeared in such publications as MIS Quarterly, Journal of MIS, and Information and Management, among others. He is Editor of AISWorld Net www.aisworld.org and has served on the editorial boards of several journals. He served as co-chair of the inaugural conference of the Midwest Association for Information Systems (MWAIS) in 2006 and as the president of MWAIS during 2008-2009. Jeff Word, Vice President of Product Strategy, SAP AG. Mr. Word is responsible for defining SAP’s future product strategy and fostering product innovation inside SAP. Mr.. Word has more than 14 years’ experience in business consulting and IT strategy working for Global 1000 companies in the high tech industry. Over the last 8 years at SAP, he has driven the evolution of enterprise technology strategy with focus on corporate process improvement initiatives and services-based IT architecture design. 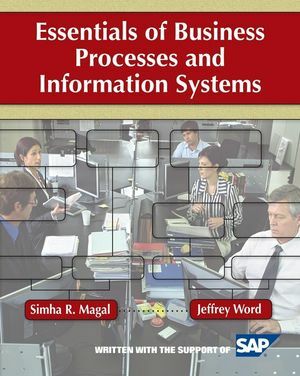 Chapter 1: Organizations, Processes, and Information Systems. Chapter 3: The Procurement Process. Chapter 4: The Fulfillment Process. Chapter 5: The Production Process. Case Study: The book illustrates all of the key concepts by utilizing a straightforward case study of an individual company throughout the book. The case describes a manufacturing organization in terms of its key processes. Student assignments are also based on this case. A 2-Step Learning Process: Students will first execute processes on paper (i.e., create the process flowcharts and documents associated with the process) then execute them in a simulated SAP® environment. Simulated SAP Environment: Assignments and exercises in the textbook can be completed using the market-leading enterprise software, SAP®. This book is written in partnership with SAP® and includes access to a hosted system that simulates the use of the most recent SAP® software. Access to a live SAP® system or membership in the SAP University Alliance will not be required to use the simulated environment. This simulated SAP® environment is indistinguishable from an actual system. Assignments are automatically graded and data regarding the assignment will be submitted to the instructor.